Snow Essential Oils | Karla's blog about essential oils and the products you can make with the oils. Karla's blog about essential oils and the products you can make with the oils. How to Make Lush Inspired Bath Bombs! Stressed out from holiday gift shopping and can’t afford the amazing Lush Bath Bombs? Well don’t fret, there’s a solution — Make Your Own! 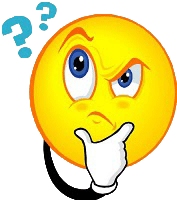 If you are like me, you may be thinking “too much work” or “when do I have time for that?!? !”, but Stop Right There! You deserve it! Plus it only took me like 5 minutes to make them because the longest part of making them is waiting for them to dry. Therefore, there is no excuse for making them because it can be done using simple household ingredients and essential oils that you can get from me! Bath bombs aren’t just fun and an easy way to enjoy the benefits of essential oils. They are also entertaining to use, have you used one before? It Fizzes!!!! Don’t have time to take care of yourself and take a nice relaxing bath? Then I suppose you can ignore what your body needs and just use the bath bomb while you shower as it’ll still release the aroma of the essential oils into the steam. Add 8-10 drops of the essential oil or essential oil blend of your choice. Mix well with spoon until soft dough is formed. It should have the consistency of damp sand. 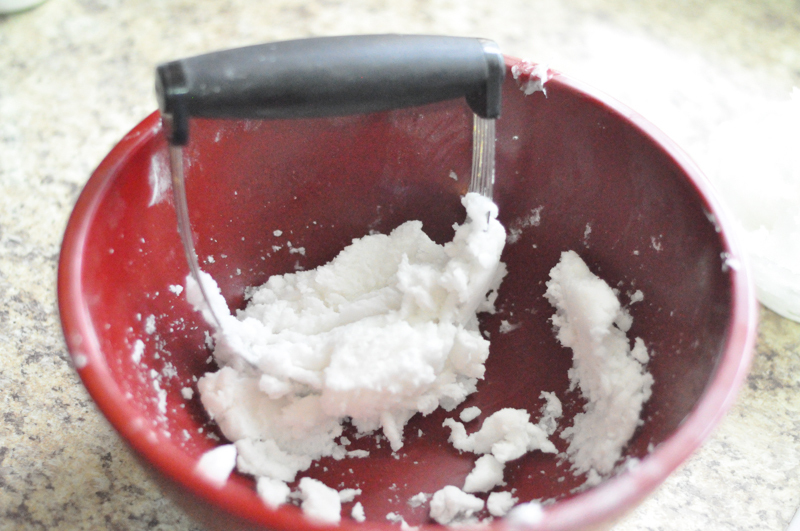 If the mixture is too wet, try adding a little more baking soda and cornstarch until consistency is correct. Optional Step: After Bath Bombs are dried, seal them in bags and place in a fun container. Note: You can choose any combination of essential oils to best suit your needs. For relaxation, try Lavender or Serenity®. For a mood boost, try Elevation, Citrus Bliss®, or Peppermint. Major Changes to the Blog! So DoTERRA changed their compliance guidelines which will impact me and this blog greatly. Dose of DoTERRA is getting a name change and a few other changes. However, change is good! I am using this opportunity to create a small logo to go with the new name (coming soon!) as well as growing the blog. I promise that even though this blog is going through an identity change, the amazing content will continue. DoTERRA was concerned that some of their Wellness Advocates have been making irresponsible claims about their products and it attracted the attention of the FDA. In an effort to control their brand a little more, they hope to encourage Advocates to use their official DoTERRA websites. However, I like blogging about the benefits of essential oils so I will not be specifically promoting DoTERRA but rather the benefits of essential oils as a health alternative. This doesn’t mean that I’m leaving DoTERRA oils; on the contrary, I still think they have the best products. But any official marketing has to be done through the proper channels and this blog is simply my outlet to talk and educate others about essential oils. 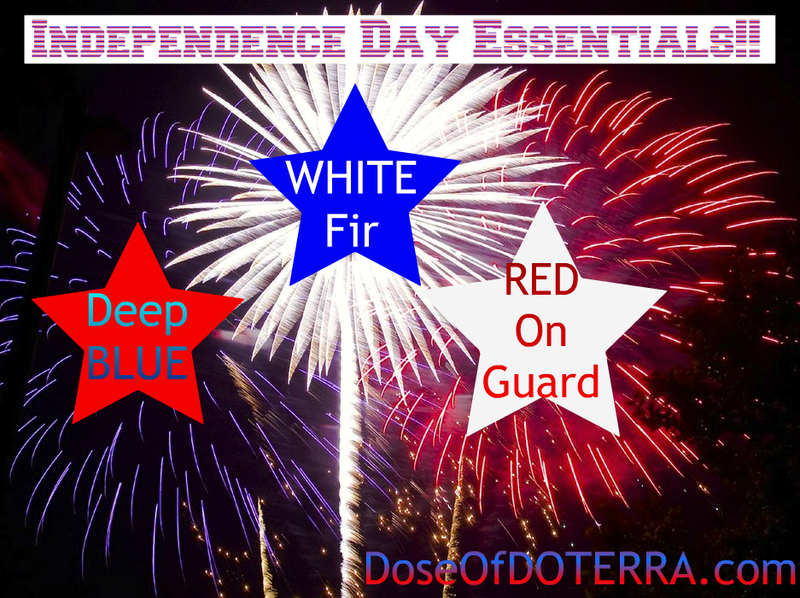 Red, White, and Blue Essentials for Independence Day! Rub on muscles before and after working off that delicious BBQ food to reduce discomfort. After long hours of watching the fireworks, try rubbing Deep Blue essential oil blend on the shoulders and neck to recover and ease muscle tension. Rub Deep Blue on lower back muscles after a long day of BBQing and being “young” again. Apply to achy muscles and joints after a long and eventful day celebrating the 4th of July. Diffuse or apply to chest to promote clear breathing after inhaling firework fumes. Add 1-2 drops to a hot bath to relax and breathe after spending a LONG day with family. Diffuse to reduce mental fatigue as you keep up with the hustle and bustle of this holiday. Gargle with a few drops of On Guard as a healthy mouth rinse or for an irritated throat, don’t want to be sick for the celebration! Add to a dishwashing sponge or cloth to purify and eliminate odors during the BBQ cleanup. Use on stainless-steel surfaces to eliminate tough, caked-on spills if you decided to clean up after all the festivities are over. Combine a few drops of On Guard with Fractionated Coconut Oil for a natural hand cleanser after eating that yummy BBQ. Commercial deodorants are made with chemicals and artificial fragrances that can irritate your skin. If this is the first time you have read my stuff, you may not know that I have very sensitive skin; therefore, I was already limited to what deodorants I could use. Then, upon discovering that commercial deodorants were affecting my hormones, I immediately discontinued using them due to the high amounts of aluminum in it (the main ingredient to make it an antiperspirant). Why, you might ask? Well, check out these two sources for some research on how toxic aluminum is for your body: “Aluminum in your deodorant – The Inside Scoop” and “Aluminum Intake and It’s Toxic Effects on Health”. 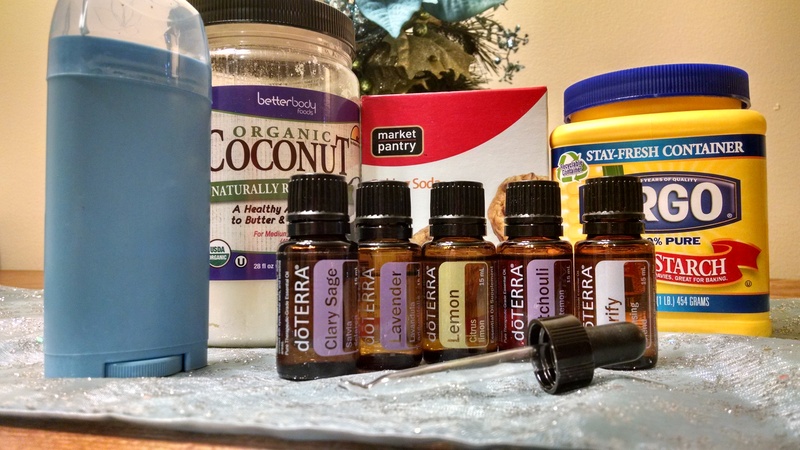 There are deodorants out there that aren’t as bad, but there is a healthy alternative to commercial deodorants—make your own, like I did! 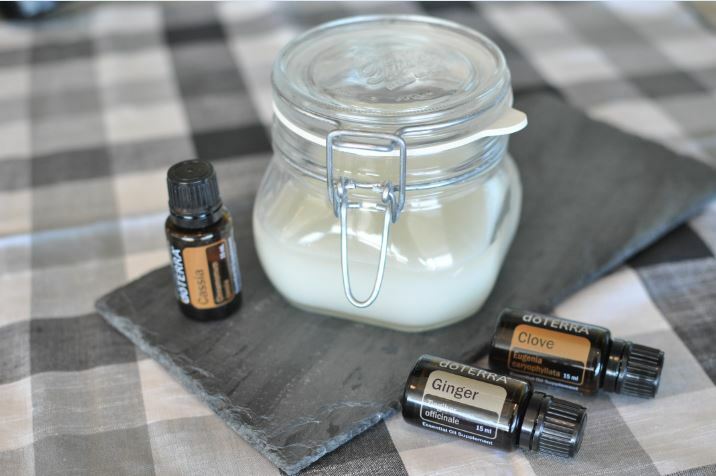 Making your own deodorant is affordable, natural, and great for your body and the environment. And as a HUGE plus, my husband loved the scent I created with essential oils so much that he asked for me to make one for him! 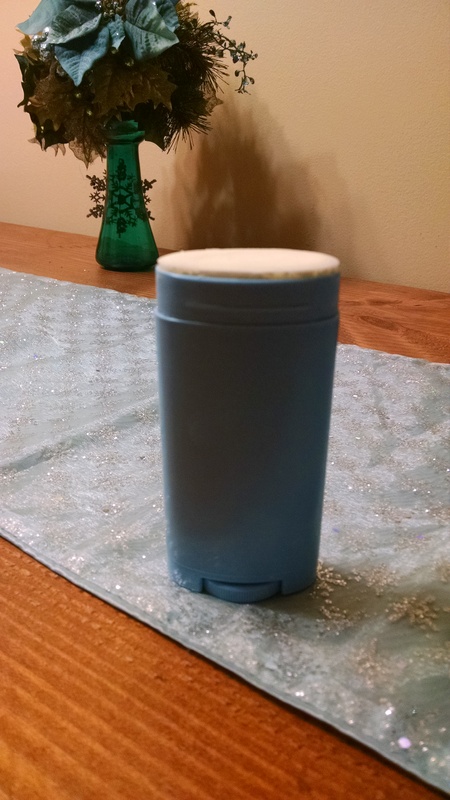 So, the blend I used for the deodorant recipe here is perfect for both males and females. However, feel free to come up with your blend when you try it out. Ok, let’s get started! Recommended essential oils: Lemon, Melaleuca, Lavender, On Guard, Lime, Geranium, Lemongrass, Purify, and Thyme. PLEASE NOTE: If you live in a warm climate, add one ounce of melted shea or cocoa butter to recipe. 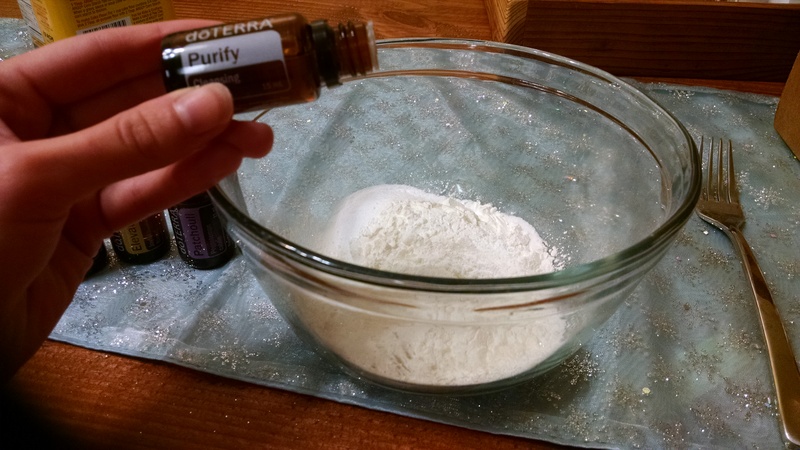 Combine baking soda, arrowroot (or cornstarch), and essential oil into bowl. Combine coconut oil with other ingredients one tablespoon at a time until mixture is at the desired consistency. (I forgot to take a picture of this step so here is one from DoTERRA’s blog. Press firmly into an empty deodorant container and let sit until the coconut oil solidifies. (I placed mine in the refrigerator for 4 hours). You’re done! Simply apply as needed. The consistency will be slightly silkier than store-bought so you won’t need to apply as hard or as much! To purchase dōTERRA essential oils please visit my store here, or contact me via email (Karla@DoseOfDoTERRA.com) if you have any questions before you order and enjoy! These statements have not been approved by the Food and Drug Administration because essential oils are not a drug. dōTERRA products are not intended to diagnose, treat, cure or prevent disease. Pregnant or lactating women and persons with known medical conditions should consult a physician prior to the use of any dōTERRA product. 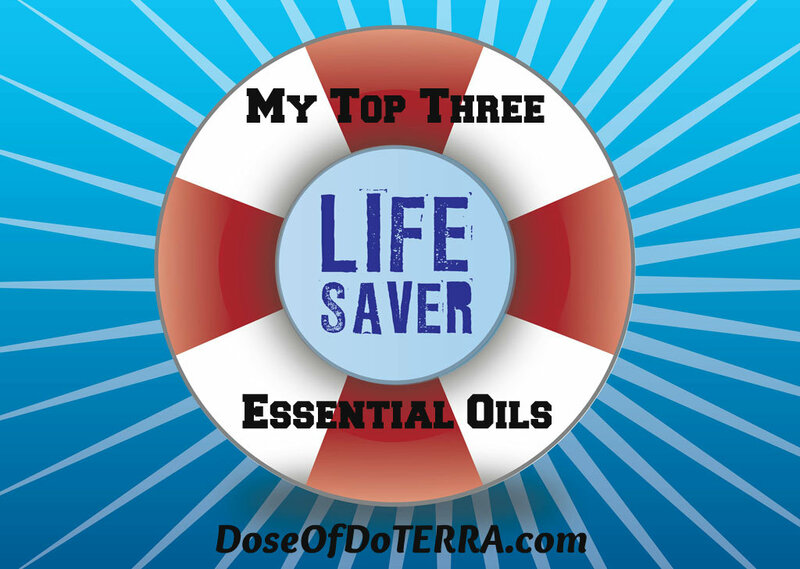 On the 6th month anniversary of using essential oils, I figured I would do a fun post about the top three essential oils that have been a life saver for me! If you are one of those people that would rather see scientific research than personal testimony, click here to learn more. But if you are like me and need the best of both worlds, keep reading for my quick guide to My Top 3! As it turns out, my skin is very sensitive to certain products, cleaners, and other random things so I have found myself constantly reaching for lavender! Lavender has helped to soothe my skin irritations, helped my skin recover quickly, and replaced chemical deodorizer sprays. With all the stresses of life, I tend to rely on this essential oil to help alleviate muscle tension while it relaxes me and helps me keep a cool head during distressing times. Take a little “me time” for yourself and add it to your bath to soak the stress away or apply to your neck and temples when you’re at work and you don’t have time for a nice, relaxing bath. I also suffer from insomnia and my thoughts just can’t seem to shut off so I have been regularly inhaling lavender through a diffuser to help me get a good night’s rest (which is essential when trying to function through my busy day!). If I am too lazy to get my diffuser ready, I just apply a few drops to my pillow and the bottoms of my feet. Lavender is definitely one of my most used essential oils and I consider it a must-have oil to have on hand at all times! Deep blue is essentially tied with lavender in the fight for top favorite oil because of how much we use it at home, work, and school. It has helped my husband and I so much! DōTERRA Deep Blue is not just a soothing solution for sore muscles and joints. The effects of this carefully formulated blend of Wintergreen, Camphor, Peppermint, Blue Tansy, Blue Chamomile, Helichrysum, and Osmanthus are deep and penetrating with lasting results. Once gently rubbed into the area of discomfort, Deep Blue resembles the feeling of Icy Hot as the cool therapeutic benefit will be felt almost immediately. This incredible blend gives me instant relief from my frequent back and neck pain, as well as helps my worn-down muscles and joints after a long day at work. Like I have said before, put away the Icy Hot, Ibuprofen, and Aspirin for a moment and try out this blend! I have found that this blend does a better job of helping with my pain and soreness than those other medications combined. For further context, Read My Story on how this one blend helped me! Peppermint is not only amazingly yummy and smells wonderful but it also helps with upset stomach, headaches, and oral health. One quick tip is that I use it as a mouth rinse/breath freshener on the go (did I mention it tastes great?). I don’t need to use much in order for it to be effective! I tend to be a night owl, especially due to my insomnia, so mornings can be difficult. A couple drops of peppermint on the wrists and deeply inhaling will help rejuvenate and refresh your mind to start off the day right. Occasionally, I will add a drop of peppermint to my smoothies/shakes for a delicious twist to my usual snack and it can also be used in many different desserts and other DIY projects. Who knew one could get hot flashes way before menopause? Well, I get them. Much to my surprise I might add, so what do I do? Why, I use peppermint essential oil, of course! Peppermint is a great fever and inflammation reducer and the cooling effect on my skin helps to slowly drop my temperature to a more normal level during my “episodes”. When my Deep Blue is not readily available, I grab my peppermint oil and massage it on my forehead for relief. What are your top 3 favorite oils? If you have 2 minutes to respond, click the comment box below and type up a comment! Let me know how you use your essential oils and if you have never tried essential oils before, you can see them here; try them out for yourself! Please feel free to email me or post below with any questions and/or comments you may have. Enjoy! It’s finally that time of year again! Some people already have their tree up and decorated, while others are waiting until the last minute. Whatever your situation, there is no doubt that there are certain smells that simply remind you of the holidays. This is the time for sugar cookies and hot cocoa (or nutmeg for some brave folks). A time to snuggle up next to your loved ones as you enjoy all the sights and smells of Christmas. One particularly special scent that I love is the limited edition of dōTERRA’s Holiday Joy Blend! This blend incorporates so many wonderful smells that many associate with the Holidays. Wonderful scents of wild orange, pine, cassia, cinnamon bark, nutmeg, and vanilla make up this unique blend. Simply make it into a spray, put it in your diffuser, or use it as a perfume to really get into the Holiday spirit! There are many other combinations that people like to diffuse during this time of year, so hold onto your cookies and milk, folks, and prepare yourself for these wonderful holiday concoctions. Please Note: These are not the only blends. Get creative, and if you discover a blend you love, please email me at karla@DoseOfDoTERRA.com! Add all essential oils to a glass bottle. One 1/4 oz bottle will hold any of these blends which can be bought on Aroma Tools, Amazon, or My Oil Business for a decent price. Screw cap on tightly and invert the bottle to blend the oils. Do not shake! Allow the blend to sit for a couple of hours, smell test, and make any adjustments to your liking. To make measurements easier, you may want to use a dropper which has helped me out a lot! Please feel free to wear these blends as perfume/cologne or any other way you choose, but if you plan on using a diffuser, here are some options. DoTERRA diffusers available include the Aroma Ace, Lotus Diffuser, Aroma Lite Diffuser, and our newest petal diffuser! Enjoy as your space fills with the amazing aroma! There are other diffuser options at Aroma Tools and My Oil Business if you would like to see what else is out there. Visit my website to see DoTERRA’s full line of essential oils and diffusers. 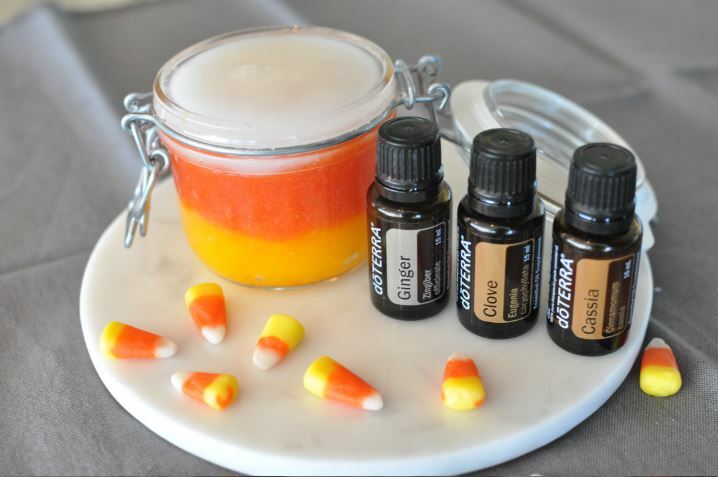 I found this Festive Fall Sugar Scrub recipe on the DoTERRA blog and I thought that it would be fun to share! For some of you that don’t know, sugar scrubs are a great way to exfoliate and soften your skin, and the great thing is that you don’t have to limit yourself to the recipe here! Feel free to customize your sugar scrub using different types of sugar, salt, oil, and essential oil. The editor of the DoTERRA blog said “this festive fall sugar scrub is gentle on your skin and has a delicious spicy fall aroma. This scrub is naturally white in color but can be glammed-up with some natural, skin-safe, food coloring. The options are endless!” This recipe can also be changed into cheap and easy Christmas and Birthday gifts which will definitely come in handy! Enjoy. 1. Combine sugar and Fractionated Coconut Oil into a bowl. 3. Stir until the mixture is the consistency of a slushy. You may need to add more sugar or Fractionated Coconut Oil for desired consistency. If you want to add color, now is the time. For separate colors, divide scrub into bowls depending on how many colors you want. If you want three colors, divide into three bowls. Color as desired and carefully pour on top of each layer. 4. Add to an air-tight container. You’re done! Use 1-2 times a week on hands, feet, legs, or arms. Follow with dōTERRA hand lotion for best results. I want to see your results! Please take a photo of your festive fall creation using dōTERRA products and post in the comments below or email them to me at Karla@DoseOfDoTERRA.com. 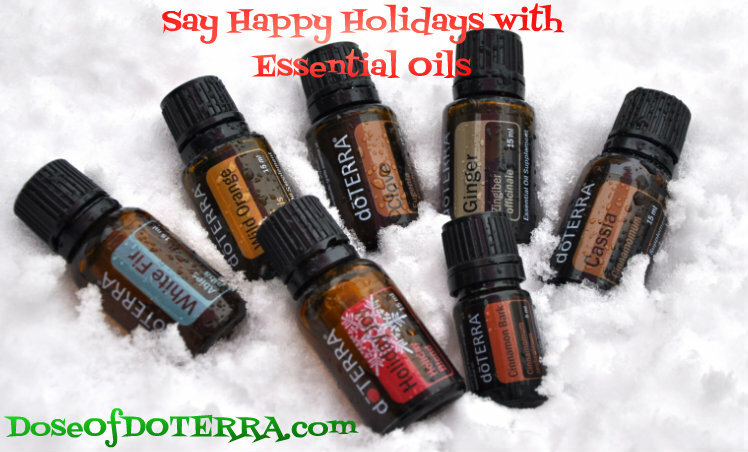 DoTERRA essential oils can be purchased here at my DoTERRA store! I tried a little experiment. Instead of buying an expensive, toxic cologne, I put a personal (and healthy) touch to my husband’s cologne this year by making it myself. Cologne and perfume making is easy and fun. I got the recipe originally from DoTERRA’s official blog and they said the cologne recipes have been tried and tested by both men and women and have all been unanimously given two thumbs up. I personally made the Spice Pick-Me-Up, but feel free to try any of the blends mentioned or switch up the oils to make your own personal blend. Now to be all technical… These cologne recipes are about a 20% oil and 80% carrier oil based which I discovered was still super strong because I picked a heftier scent. To make a stronger scent (really only needed for softer/lighter scents), make it up to a 30/70 ratio. The cologne recipes below are for a 1/3 oz. vial (10ml). You will need to adjust your recipe if you use a smaller or larger vial. 1/3 oz. roll-on vial (10 ml). You can purchase them here. Directions: Ok, you have got your supplies and you are ready to begin! 1) Take a glass vial and combine all necessary drops of essential oil and Fractionated Coconut Oil into bottle. Attach the roll-on cap and shake the vial until the mixture is combined. I didn’t have a 10ml roll-on, so I just halved the entire recipe. 2) Let mixture sit for at least 24 hours before use. This allows the oils to fully combine. Tips: You can also put the mixture in a small refillable cologne spray if you prefer to spray instead of a roll-on. 3) You’re done! Wasn’t that easy! Apply cologne to wrists for best results. Tips: To see if you like the scent, make a small sample first. If you like it, make a larger batch. You can always add more oils to the mixture later. Has your interest been peaked but don’t want the scent I chose? Here are some other cologne blends that you might be interested in. So there you go! 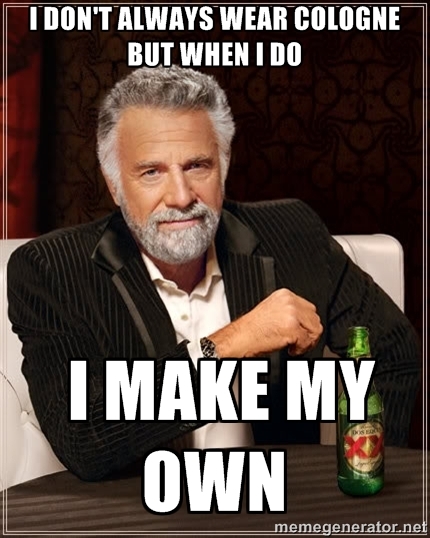 I hope this post sparks an idea and helps unleash your inner DIY self. Please comment below or email me with any personal cologne blends you came up with. If you want to try a cologne but don’t have the time to assemble it, just let me know and I can make it for you. Enjoy and to purchase these oils go to my store at: mydoterra.com/karlasnow. By now you might be curious on why you should start using essential oils, which is a great question! There are a zillion different reasons but I dwindled it down to five different reasons why you should start using essential oils. Even if you aren’t interested in using essential oils, please keep on reading for some important information. You might be thinking “no way”, but it’s true! With my car accident, I had to spend a little over $300 in pain medications for a 6 week period when DoTERRA’s Deep Blue blend (valued at $42.67) replaced all those medications and will last me a considerably longer time (going on 2.5 months now!). When you dry the herb, it loses its functionality, but essential oils are already in their most easily digested form, so it’s very impactful to our bodies. Essential oils are 70% more effect in its essential oil form than herb. I have conducted extensive research to make sure that the oils I sell actually do what they say. I have compiled over 25 hours of research onto my Scientific Research on Essential Oils page. Antibiotics and things like hand sanitizers were formulated to kill the bad bacteria; however, since they can’t tell the difference between bad and good bacteria, these synthesized products kill every bacteria in sight like a plague. Unlike synthetic products, essential oils only treat the bad because that was their purpose when they were in plant form. So, the essential oils keep the good bacteria intact so you don’t get some of the different infections and major side effects/consequences like you would with an antibiotic or hand sanitizers. I’m not saying that medicines are evil, please keep in mind that there are some diseases that medicines are needed. There is collectively a ton of knowledge available if you should want to take charge of your life with natural alternatives to medicines, and my personal passion is to help others and inspire them to take control of their health. Medications are made of synthetic materials that slowly begin to not work anymore as time goes on. Have you ever been in dire need of a medication only to find out that it expired? When synthetic medications have expired, it can have horrible side effects. Of course you have to store essential oils right, but when you do store essential oils correctly, the shelf-life can extend over 10 years! Oils should be stored in a cool, dark place and make sure the lid is sealed tightly. A nice thing about that as well is you don’t have to deal with nasty side effects when you use essential oils. You can use Peppermint essential oil for a headache and get a better mood, and you can use Lavender to help you sleep. Since each oil lasts so long and it is processed naturally in the body, you don’t have to deal with the same things you would with traditional medicines. For the sake of time, please check out my blog posts on Reinventing Healthcare in Your Home and Reinventing Healthcare in Your Home Part 2 for more detailed information. Those oils have been tremendously helpful to me and can be used for multiple purposes. My pharmacology professor explained that the drugs we have come to rely on originally came from natural sources… from Essential Oils. However, so many things are added to it that is is no longer considered pure. Synthetic oils don’t help the body, only therapeutic grade essential oils can which can be very expensive for manufacturers. Medically speaking, our bodies were not created to digest synthetic medicines so we don’t digest them properly. In the labs, they took the medicinal properties in the natural product and recreated it in a petri dish. For most people, their medicine cabinet is cluttered (or very organized but still full) with many different drugs and medications that treat certain ailments; however, did you know that a few essential oils can replace most if not all the OTC products that are taking up space in your medicine cabinet? Well thankfully you can! You might be skeptical about all this and I don’t blame you because SO WAS I! Crazy right? When I was first to exposed to essential oils I bought the intro kit because I felt obligated to after the lady helped me out with my back pain with peppermint and deep blue after a race. Once I got home, I put it on a shelf and forgot about it until two months later, read my story here. Deep blue changed my life and helped me rediscover the way I can take control of my health for the better. I know this is a lot of info, but here are some key points I would like you to remember: Every oil has multiple uses, every oil is CPTG (certified pure therapeutic grade), and they are very concentrated! Only a tiny amount is necessary for great results. Some other key points include: their shelf life is lengthy (2-5 years for citrus oils, and usually over 10 for everything else if kept out of sunlight) and yes, even though they are not cheap, please consider all of the drugs and medications you buy for ONLY ONE ailment. Essential oils have multiple healing qualities and they don’t just treat the symptoms, they heal the problem without any side effects. If you’re interested in learning more or even ordering a few oils, check out my extensive research here and my store here. Earlier this summer, my husband and I were on our way home from a 4th of July party in our tiny little green Toyota Corolla. The freeway was narrow, only two lanes, and traffic ahead of us was slowing down. I was in the passenger seat, and my husband started to apply the brakes. We were talking, although now I don’t remember what about, and as we slowed down we turned toward each other. Suddenly, it seemed as though my entire world exploded. The horrendously loud sound of metal smashing into metal assaulted my ears as our car rocketed off the freeway and slid haphazardly into the shoulder for a good 20 feet before stopping. The shock was replaced by pain as my back, neck, and head instantly began throbbing. As it turns out, we had been hit by a medium sized truck; the driver had not seen the traffic slowing down and barreled into us going nearly freeway speed. Our car was totaled and I was in excruciating pain. Later, I would discover that I had sustained a concussion, strained ligaments in both my neck and my back, and as X-rays showed, a dislocated vertebrae in my neck. The doctors at Kaiser put me on three different types of medication, and when that didn’t work, they switched out one of them for a heavy dosage of an antidepressant. After a few weeks of this regimen, I was still in a lot of pain but I had been instructed to up my dosage if the pain did not subside. However, I soon discovered that this would be a problem: not only were the drugs ineffective, but they were doing a number on my body! I was experiencing stabbing pain in my kidneys and there were other indications that I was simply overloading my system. I knew I had to find another way for pain management. Then I remembered an experience I’d had with essential oils earlier in the year. While participating in a 5K, a DoTERRA rep was at the finish line, and as I chatted with her, I mentioned that my back was hurting from the run. She gave me some Deep Blue and Peppermint to put on my back, and the relief was instantaneous! After recalling this incident, I immediately ordered up some Deep Blue for my back and began treating my pain with essential oils, with great success. Now, I was able to experience pain relief without worrying about destroying my kidneys and liver. Because of this, I am committed to helping others discover the amazing benefits of essential oils for themselves and their families. I hope you will join me on this journey!